Turns out he thought that was stupid, which it was, so I renamed it. Basically it’s my copyright-infringement version of Bogie’s pasta salad but with bacon. Because… you know what, no. It needs no explanation. Bacon is its own reason. And there you have it. This pasta will make your transition from lake to tailgate smooth – and delicious – so make sure you have some on hand. Add chili power, Cavender’s or your favorite all-purpose seasoning to taste. Chill (at least a few hours, preferably over night). Before serving, check to make sure the pasta is not too dry and add more, ahem, “saturating” ingredients as necessary and the lemon juice. *Make sure to cook the pasta a little under as it will sit and soften in the mayo. 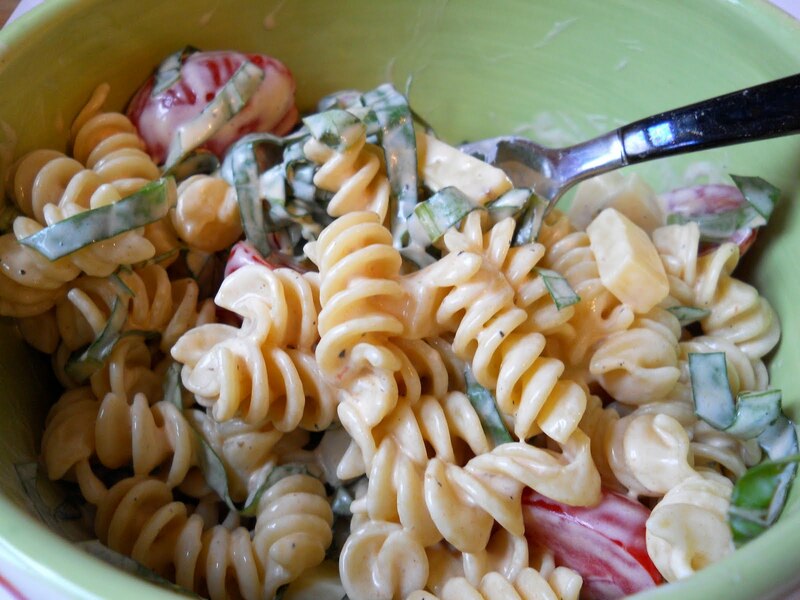 Also, don’t buy multicolored rotini for this because it’s much prettier red, white and green. But that might be the OCD talking, so you do what you want. **Mince the life out of that little effer. I mean it. No big chunks of cucumber here. The slime will not stand. mmmm, Bogies. Will you find/copy the Bogie’s shrimp salad recipe?!? Its delicious. I saw a recipe on here before that used Naturally Fresh Ranch salad dressing and it tasted just like Bogie’s pasta salad. What happened to that recipe? It was not like the one above and I would like to have the other recipe as it was delicious. When I use the Naturally Fresh Ranch dressing and the Mayo, what do I exclude from the recipe above? Just use 3/4 cup of mayo and 3/4 cup of ranch – you really just keep adding mayo until you get to your desired level of creaminess, so I’d add those and go from there! Hi Stephanie – Do you know the secrets to making the bogies potato salad so delicious? LOL – Is it a mix of mayo and sour cream and some thyme? Thanks. Evan. I do not know unfortunately, but I would bet you’re onto something with the mix of mayo, sour cream and then some herbs! I’d go with chives or finely minced green onions.